Measure and Sieve the ragi flour, whole wheat flour and mix well with baking soda, baking powder and salt. Also preheat the oven to 180 degrees for 10 minutes. Take ripe banana and mash it well with a fork. Alternatively you can blend the chopped banana pieces in a blender to puree them.Once the bananas are well mashed, add eggs, oil and vanilla essence. Then add milk. Stir it well with a hand whisk until the eggs are whipped well and oil is mixed evenly. Then add sugar and mix it again until sugar is completely dissolved. Now add the sieved whole wheat flour and ragi flour mixture to the wet ingredients. Gently fold everything well for 10-15 seconds. Don't over mix. The final mixture should be slightly thick. Line up the muffin tray with muffin liners. 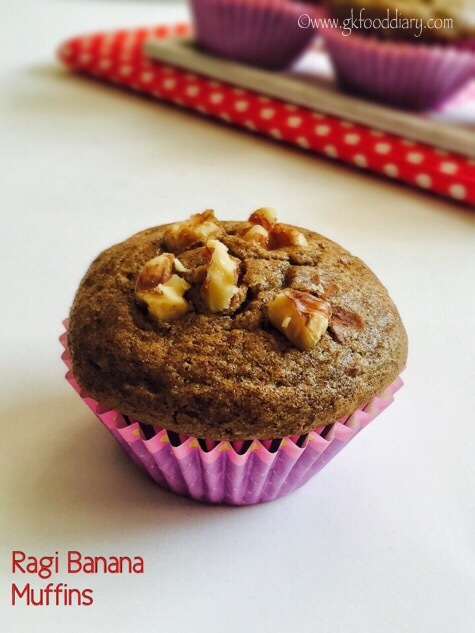 Pour the prepared batter into muffin liners and top it with broken walnuts. Bake in the preheated oven for 15-20 minutes (baking time depends on the size of the muffin tray and oven) at 180° Celsius till tooth pick inserted in the center comes out clean. Allow to cool in tray for 5 minutes once done.